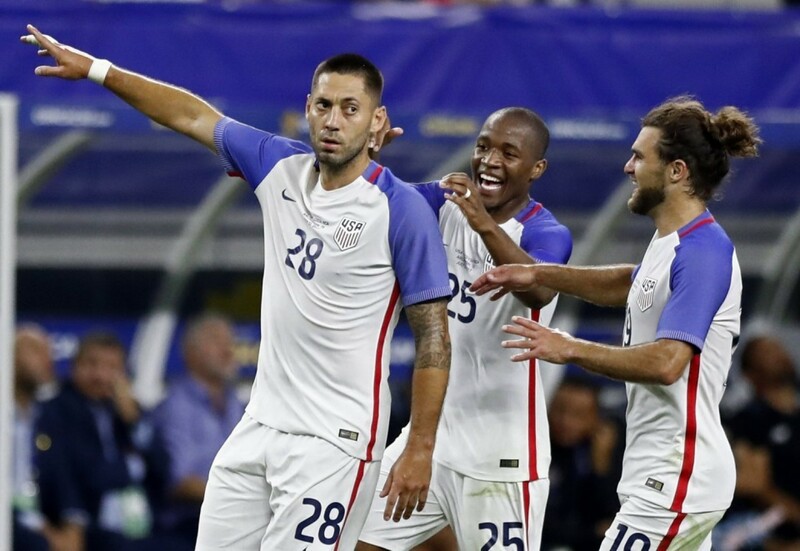 Clint Dempsey drew level with Landon Donovan as the United States record goalscorer for the men’s national team as they booked their place in the Gold Cup final. The 34-year-old began the semi-final match against Costa Rica on the bench at the AT&T Stadium in Arlington, but the Texan was expected to feature in the latter stages in front of a local crowd as he attempted to match Donovan’s tally of 57 goals. Jordan Morris nearly gave the United States an ideal start after hitting the post with just 12 seconds played. Costa Rica would prove to be tough opposition for the hosts, as they looked to continue their strong defensive record, having conceded only one goal at the tournament to date. While defensively sound, Costa Rica also showed adventure going forward as American goalkeeper Tim Howard was forced into a smart save in the 37th minute to keep the scores level at half-time. The introduction of Dempsey enlivened the home crowd and the Seattle Sounders forward would make an almost immediate impact. Having picked the ball up on the halfway line, Dempsey dribbled past a couple of defenders before feeding Jozy Altidore. The powerful forward struck a left-footed shot through Costa Rican goalkeeper Patrick Pemberton to give the United States a 1-0 lead, after 72 minutes. Dempsey would steal the headlines though, as he curled a superb free kick beyond the goalkeeper nearly 10 minutes later to achieve his landmark goal. The strike secured a 2-0 victory for the United States and keeps them on track for a sixth Gold Cup title. The result also comes as a welcome antidote to their 4-0 loss to Costa Rica in World Cup qualifying, back in November. The US will face Jamaica in the final on Wednesday at 8:30 p.m. CST.